The era of BCS is over. College football NCAA has 10 year 4 team playoffs instilled. I would think 8 or 6 (top 2 gets a bye in first round) team playoffs would be the best to get the true champion. I dislike polls. SEC is still the favorites. They are in a Dog eat Dogs world. Tennessee(1), Florida (2), Alabama (4), Auburn (1), LSU (3) all have BCS titles and played multiple National Championship games. This year, Bama, Auburn are loaded. New but seriously talented LSU team is never far behind. Florida is just one year removed from a 11-1 regular season. Current Tenn team is not elite. However, Spurrier's South Carolina, and Pinkle's Mizzou have great weapons. My Hogs are coming off the worst season ever. 3-9. 0-8 in conference play. We will face the defending SEC champion in the first game. The playoffs although only 4 teams, brings a fresh air to the old bowl system. Can't wait. Counting my days!!! 25. So we go for ACC next. Weak conference, however, they have Florida State the defending champion and the Heisman winner, Winston. They will not be tested much this season. Clemson is post Sammy Watson era. L'ville can't do anything in the first season at ACC. The rest are just fillers. The last game against Florida should be a cake walk at home. Then it PAC12. After SEC they are the deepest. Oregon, Stanford, UCLA, So Cal, Arizona and Washington schools are very strong. They have few good new coaches. Some adjustment needs to be made. I don't think anyone would pose a threat to Oregon or Stanford for supremacy. Colorado, Utes, and Cal are the punching bags. Oregon State beavers are middle of the pack team. Come bowl season they should be favored again in every game. The next is a toss up. Big12 (with 10 teams), Big10 (B1G - 14 teams). Big12 is weaker with A&M and Mizzou leaving and WVU and TCU joining. Texas is in a middle of regime change. Charlie Strong has got his whip going all through the summer. It is Oklahoma and Oklahoma State and the rest. As for B1Gs, Ohio State and Michigan State will be knocking heads again. I don't Wisky or Nebraska, or Iowa has any prayers in the conference championship game. Then there is N Dame - the privileged (I dislike them for that) - independent and smaller conferences like MWC, Big East, Sunbelt etc. Not worthy to make a run at the playoffs. 1. Florida State: Beginning the season where they ended after claiming the final BCS title, the Seminoles expect to be at or near the top throughout 2014. Reigning Heisman winner Jameis Winston will have some less-experienced pass catchers, but the long game isn't likely to miss a beat with Rashad Greene and Levonte Whitfield. TE Nick O'Leary also is back, and senior Karlos Williams will pace a deep TB corps. Look for DE Mario Edwards, CB P.J. Williams and S Jalen Ramsey to emerge quickly as the Seminoles'' next wave of defensive stars. 2. Alabama: The, well, process of replacing a number of key players, more than a few of whom moved on to the NFL, never takes long for Nick Saban. The sound foundation of the offense is a powerful front line that will pave the way for flashy TBs T.J. Yeldon and Derrick Henry. Incoming Florida State transfer Jacob Coker is the perceived favorite to earn the starting QB job, and having veteran WR Amari Cooper in the huddle will help. LB Trey DePriest and S Landon Collins will likely emerge as leaders for a talented but youthful defense. 3. Oklahoma: QB Trevor Knight, whose stellar outing in the Sugar Bowl victory against Alabama, is back to lead the attack. He'll be throwing to WR Sterling Shepard and QB-turned-TE Blake Bell. Touted freshman TB Joe Mixon's career hit a speed bump before he ever took the field with an assault allegation, but Keith Ford was and is likely to be the main man in the backfield regardless. It's the defense, specially the front seven, that really has OU faithful thinking championship. DEs Charles Tapper and Geneo Grissom and LBs Eric Striker and Frank Shannon will make life extremely difficult for opposing QBs. 4. Oregon: The Ducks have a signature star on both sides of the ball as they look to get back to the top of the rugged Pac-12. QB Marcus Mariota, of course, is the name most fans will recognize. The dual-threat and Heisman contender will hope for RB Thomas Tyner to become the next in Oregon's succession of speed weapons out of the backfield. The face of the defense will be CB Ifo Ekpre-Olomu. But a new starter must be found at the opposite corner, and a revamped line must gel quickly. 5. Auburn: The Tigers broke the SEC mold a bit last year riding a high-octane spread rather than a lock-down defense to the coveted league title. 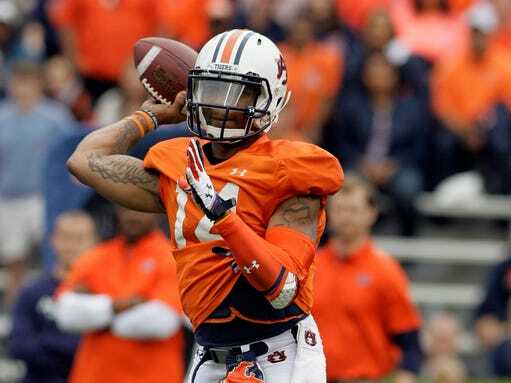 Despite the loss of TB Tre Mason, look for more of the same from Auburn with Nick Marshall back at QB. Though Mason is gone from the nation's leading ground offense in 2013, the receiving corps returns most of its production and adds potential star D'haquille Williams from the junior college ranks. The defense will have to get better, but LB Cassanova McKinzy should emerge as a leader. 6. Ohio State: A win away from playing for the BCS championship, the Buckeyes instead settled for an Orange Bowl date with Clemson. The next step to the inaugural playoff is in reach if the defense lives up to its billing and if QB Braxton Miller can stay healthy. Miller's durability will be of utmost importance this year since his line and his ball handlers will be short on experience and Kenny Guiton, who backed him up capably, is gone. The D-line will be formidable indeed with DT Michael Bennett anchoring the inside. DEs Joey Bosa and Noah Spence provide strength on the edges, though the latter will miss the first two games completing a league-imposed suspension. 7. UCLA: After nearly playing for the Pac-12 title a year ago, the Bruins want to finish the job in 2014. QB Brett Hundley hopes to do just that, and he'll have most of his top ball handlers back with him, including WR Devin Fuller and TB Jordon James. LBs Eric Kendricks and Myles Jack will be the primary stoppers on a defense that needs to develop a pass rush. 8. Michigan State: The Spartans ruined Ohio State's championship dreams in 2013 and look to repeat in the expanded Big Ten. Their Week 2 trip to Oregon provides a great matchup on the early schedule as well as something of a dress rehearsal for the Buckeyes. QB Conner Cook steadied the offense last year, and he regains the services of TB Jeremy Langford and WR Tony Lippett. The MSU pass defense should be a strength with DEs Shilique Calhoun and Marcus Rush bringing the heat and CB Trae Waynes and FS Kurtis Drummond manning the secondary. 9. South Carolina: If the Gamecocks can successfully negotiate a front-loaded schedule, they should live up to their status as projected SEC East favorites. With Connor Shaw gone, Dylan Thompson takes over at QB. In the backfield with him will be talented TB Mike Davis, and WRs Damiere Byrd and Shaq Roland figure to be his main targets. All-everything DE Jadeveon Clowney will be missed, of course, as will DT Kelcy Quarles. Much will be expected of Sharrod Golightly to lead a deep but inexperienced LB group. 10. Baylor: The high-flying Bears will be ready to light up a Big 12 scoreboard near you once again. Standout WR Tevin Reese took his skills to the next level, but incumbent QB Bryce Petty still has plenty of weapons. Antwan Goodley and Levi Norwood will provide the outside threats, and Shock Linwood could be ready for a breakout year at TB. DE Shawn Oakman and DB Terrence Singleton must make plenty of plays on defense as opponents air it out to keep pace. 11. Stanford: The bar is set pretty high for the Cardinal now that major bowl berths have become the rule rather than the exception. QB Kevin Hogan returns along with top WRs Ty Montgomery and Devon Cajuste, but eventually the Cardinal would like to establish its identity as a power rushing team. Once a rebuilt line gets some snaps under its belt, Kelsey Young or Barry Sanders Jr. could emerge as Stanford's next star TB. LB A.J. Tarpley will anchor the defense that will also have plenty of new faces. 12. Georgia: The good news for coach Mark Richt and Co. is Todd Gurley has the potential to be the best back in the nation if he can stay on the field. The bad news — that's been a mighty big 'if' for the seemingly snake-bitten Bulldogs, whose 2013 campaign was derailed by injuries and agonizingly close losses. On the plus side, QB Hutson Mason got plenty of live reps and will be ready to lead in critical early tests. Big things are expected from the LB corps, featuring seniors Ramik Wilson and Amarlo Hererra. 13. LSU: Like many of its fellow SEC contenders, the Tigers will be long on talent if a little short on experience. Both ends of the passing game will have a lot of new names on the depth chart. The ground attack is on more solid footing, so TBs Kenny Hilliard and Terrance Magee with the help of a veteran front line will have to carry things as the new quarterback and receivers find their way. The front line could be the strongest position group on the defensive side as well, featuring Jermauria Rasco and Danielle Hunter flanking DT Christian LaCouture. 14: Wisconsin: The Badgers could be in the best position to benefit from the Big Ten's new divisional alignment. Their offensive identity will be established right away, with standout TB Melvin Gordon and capable backup Corey Clement operating behind a physical and battle-tested interior line. Incumbent QB Joel Stave is back, but he'll be challenged by Tanner McEvoy in camp, and breakaway WR Jared Abbrederis is gone. The defensive front also lacks experience, which might not bode well for the opener against LSU. 15. 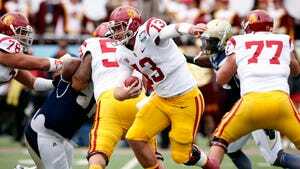 Southern California: The Trojans find themselves in catchup mode in the Pac-12 South as Steve Sarkisian takes over. There are enough pieces in place for a solid foundation. QB Cody Kessler and WR Nelson Agholor figure to be key cogs, but more targets must emerge and a go-to tailback, likely Javorius Allen, needs to step up. The defense might be in even better shape. DE Leonard Williams, LB Hayes Pullard and SS Su'a Cravens provide anchors at each level. 16: Clemson: The Tigers' 2013 season had its highlights at the beginning against Georgia and at the conclusion with the Orange Bowl triumph against Ohio State. Clemson must hit the ground running again, and must do it without QB Tajh Boyd, WRs Sammy Watkins and Martavis Bryant, and TB Roderick McDowell. New signal caller Cole Stoudt is a senior who's been in the system but never started a game. WR Mike Williams could emerge as the new deep threat. There's better news on defense, where DEs Vic Beasley and Corey Crawford and DT Grady Jarrett will create havoc in opposing backfields. 17. Notre Dame: The Fighting Irish begin their loose confederation with the ACC, though their challenging slate retains Big Ten and Pac-12 ties as well. What kind of results they get remain to be seen. QB Everett Golson returns and has WR DaVaris Daniels as a potential game breaker. There's depth if not proven production in the ground game, with Tarean Folston expected to lead the platoon. The defense will be even younger, but sophomore LB Jaylon Smith could become the breakout star. 18. Arizona State: The Sun Devils won the Pac-12 South a year ago and appear to have the pieces in place to do it again. The puzzle begins with QB Taylor Kelly, who can also count on veteran WR Jaelen Strong and TB D.J. Foster to keep the points coming. The biggest questions are on the other side, where numerous newcomers to fall camp might be plugged into starting positions right away. LB D.J. Calhoun was around in the spring and figures to play a prominent role. 19. Mississippi: The SEC West is a mighty rough neighborhood, but the Rebels might be positioned to make some noise in the division just the same. Ole Miss has a luxury most conference opponents don't, an incumbent starting QB, in the person of Bo Wallace. Protecting him figures to be the unit's biggest concern, but if he has time WR Laquon Treadwell could be a downfield playmaker. The brothers Nkemdiche, DT Robert and LB Denzel, are back to anchor the defense. 20. Texas A&M: See above on life in the SEC West. Kevin Sumlin and his staff certainly know how to develop talent, but Expecting the Aggies' offense to perform at the same level following the departure of Johnny Manziel and WR Mike Evans is unrealistic. Or is it? Whether Kenny Hill or Kyle Allen takes the opening snap, there's plenty of talent up front and in the backfield. The defense, particularly the secondary, must shore itself up quickly with that opening date at South Carolina looming. 21. Kansas State: The Wildcats enter the season right where they want to be in the poll. Underestimate Bill Snyder's perennial overachievers at your peril. K-State's bread-and-butter running game will have new ball carriers, and the leader just might be freshman Dalvin Warmack. But QB Jake Waters has the threat of WR Tyler Lockett and a solid line to keep the lanes open. Senior DE Ryan Mueller will be the veteran on a defense with some holes to fill. 22. Nebraska: The Cornhuskers haven't exactly taken their new conference by storm, but they hope to be in the mix in the revamped Big Ten West. RB Ameer Abdullah is an elite talent in the Nebraska I-back tradition, though the formation looks a bit different in the modern era. He'll get help from field-stretching WR Kenny Bell if QB Tommy Armstrong can deliver the deep balls. DE Randy Gregory will anchor a solid front, but the back seven must come together. 23. North Carolina: The Tar Heels aren't in a bad place in the ACC — which is to say they're not in the Atlantic Division where Florida State and Clemson live. As such there opportunity is there to move up, but key spots on both sides must be filled. WR Quinshad Davis could be the breakout start of the offense if either QB Marquise Williams or Mitch Trubisky can excel in the starting role. T.J. Logan paces a deep backfield. The versatile Norkeithus Otis will do a little of everything from the bandit position on the defense. 24. Texas: As one of those programs where good enough isn't quite good enough, the Longhorns' faithful expect a lot from former Louisville mentor Charlie Strong in not very much time. For now, the staff will look to build a better offensive line around QB David Ash and TBs Malcolm Brown and Jonathan Gray. Defensive building blocks include DE Cedric Reed and CB Quandre Diggs. 25. Washington: Chris Petersen's creativity with offensive talent that was his signature at Boise State will be tested immediately in his new gig with the Huskies. QB Keith Price, RB Bishop Sankey, TE Austin Seferian-Jenkins — all gone. But the entire interior line is back, and WR Kasen Williams hopes to return to form after an injury-plagued 2013 season. The defense will carry Washington early on, with the likes of DE Hau'oli Kikaha and LB Shaq Thompson making noise. I do not like 4 teams up there. A&M has no business being in this list. Iowa is more deserving. Georgia and LSU are ranked too high. So Cal has to prove in the field with their first year coach. I'd take OK State and L'Ville over any of these teams. Go Dawgs! Go Tigers! 7 of the top-20 teams are from SEC :-) . Hope Georgia has a better season this time. We almost recovered last year before succumbing to close losses, but at least we weren't as bad as Gators .. lol! With A&M and Mizzou in the mix, this conference is now toughest ever. I am not sold on A&M. I know they are bringing in top 10 talents, the schedule is brutal. They'd be out of the most dominating O Line and Houdini has moved on to NFL. The new 5 star QB is not Manziel. Mizzou will again struggle this year. DGB is gone to Oklahoma. Another receiver is out. My Hogs are improving. Hopefully challenge the Bamas, Auburn's, the LSUs next year. That one year of John L Smith killed the 10 win program in just months. Last edited by Tigers_eye; August 12, 2014 at 10:53 AM..
What's your prediction on the final four playoffs teams? Power 5 conferences. Someone will sit out. If FSU stumbles either against Clemson (Unlikely at home) or (L'ville) or conference championship game against Duke or Va Tech, then they are out. 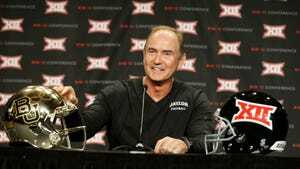 If not my suspicion would be the Big12 champ. They don't have the extra Conference championship game. Michigan State or Ohio State? FSU, Bama, Oregon and OSU. Too early to predict though. 1 loss and things shake up in college football. Can't wait for the season to start. Hoping my Syracuse Orange make noise this year. I'm a realist and I know we're still nowhere near the likes of Clemson and FSU but I really feel the other games are winnable for us. I'm predicting an 8-4 season this year but would also be happy with a 7-5 season as well. Amare Rivals.com forum thekey 7 days ban korse. HHS. I said, Saban is midget. Bama fans love midgets. Named names (bama fans) and said all included. HHS. I have been in that forum for few years now. Lets go Hogs!! Represent Arkansas and beat Auburn. Bama fans can be the most annoying fans in the country but I guess it's expected for such a good team like them. How bout them Dawgs?! If Gurley is able to stay healthy, I think we are the class of the SEC. As long as we can get by USC in two weeks (Spurrier always gives us trouble), I think we can run the table in the regular season. Especially since we get Auburn at home this year. Mijan bhai, not very knowlegable on NCAA football, but I don't think UT (Knoxville, not Austin) ever won a BCS national championship. We were co champs under the pre=BCS system in 1998 right after Peyton left. Partially right. It was 1998-99 season. Tennessee (13-0) won the 1st BCS championship under Fulmer with T Maritn on helm beating FL State (Bowden 11-2). Well week one is over. We have came to know which are the hyped up teams, which ones looks real threatening, and which one needs more improvements. SEC West: Bama has two good QB. They are the team to beat. Auburn needs play makers in the defense. They can score any time. Nick Marshall is the real deal. The backup Johnson is even better. The Iron Bowl would be a fabulous one in Tuscolusa. A&M reloaded pretty well. The defense needs some work. Boy, what a QB they have. Their backup is a 5 star freshman. Previously I thought they would have 6-6 season. Now it seems at least 8 or 9. They can't possibly have that much time to throw the ball. If they do, Sumlin will just kill it in Texas. Miss schools are strong. This will be a fun year at the SEC west. My Hogs are improving. 6-6 is a long shot and they have to win at TTech in two weeks time. What you want more? Mizzou and Florida will hang on. USC will rebound. Vandy, Kentucky and Vols are NOT contending this year. Well Oklahoma State couldn't pull off the upset against the defending champion FSU. They looked good though. Baylor, Oklahoma, K-State, Texas did what they had to do. TCU still unproven. TTech will have a difficult time if they don't improve drastically. The Hogs will be visiting them in two weeks time. UCA Bears (alum) almost had an upset. WVU, no moral victories against Bama. Iowa State. 3-9 last season. Lost to an FCS school N Dakota State. Many many moons back I use to go Morningside College, Sioux city IA. We the chiefs (then) use to play NDSU. I can't believe where Iowa State has fallen. As a whole, unless they get extremely lucky, I see no hope for Big12 in bowl season. FSU won on the road. Clemson lost to UGA. Miami lost to newcomer L'Ville. Va Tech, Duke, UNC, NC State all are also ran in. The only game that matters is FSU visiting L'Ville in their entire conference season. Wow!!! Well well well. We have Big East reject making some noise and picking up B1G. Rutgers beat Wa State in a high scoring match 41-38. Paul James is his name. You will soon hear his name on Sundays. 173 yards on the ground. Ohio State, Michigan State are the class of this conference. We will see how it ends. Iowa is almost destined to go to Indianapolis. That leaves only PAC12 from the big five conference. Well So Cal, UCLA, Oregon, Stanford cream of the crop. Washington escaped Hawaii with a 17-16 win. Hawaii won the stat sheet (every category) just not the game. #Faceplam for Colorado. The Rams just rammed the buffalos. Hahaha!!! Their hope Boise has no hope. Was taken out by the Ole Miss freshmen WRs in the 4th Quarter. Some serious matchup will be going on in week two. (7) Michigan State @ (3) Oregon. Week 2 is in the books. We found out Big10 is a dump. Stanford can't convert in the red zone. Just look at the scores. Oregon 46-27 over Michigan State We kinda knew Oregon's high powered offense would just take out Michigan State's new defense. USC 13-10 @ Stanford. 17 game home winning streak ends. USC becomes a major power now again in PAC12. Arkansas, A&M, and Clemson scores 73. Baylor 70. L'Ville 66.